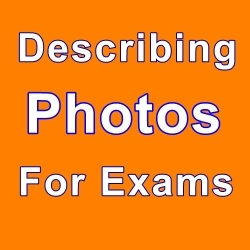 Most English examinations - IELTS, CAE, FCE and so on - require you to describe a photograph. There are certain techniques and phrases that you can re-use for most photograph descriptions, so it becomes easier the more you practise. In this interactive course, there are 10 descriptions of photos, with audio downloads and an interactive gap fill exercise for each one. This will ensure that you retain and can use the language that you are learning. This course is suitable for Intermediate to Advanced Level students of English.